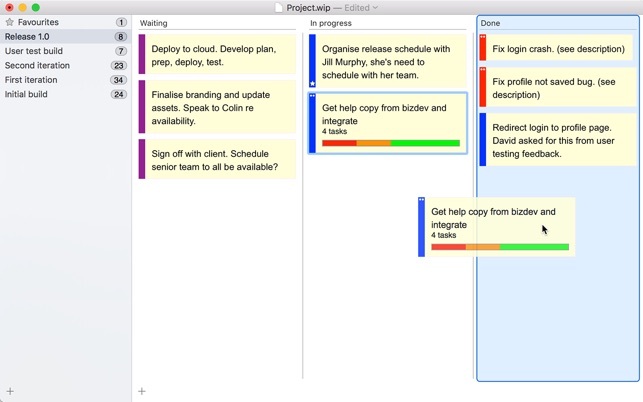 Simple and intuitive, lean and agile, project management for solo professionals and small teams. 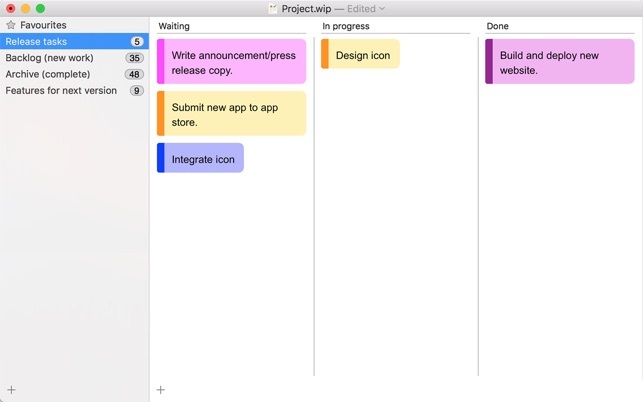 • Kanban board style interface with customisable Work In Progress (WIP) limits. • Supports card locking, favourites, priorities, tagging, file attachments and different card display themes. 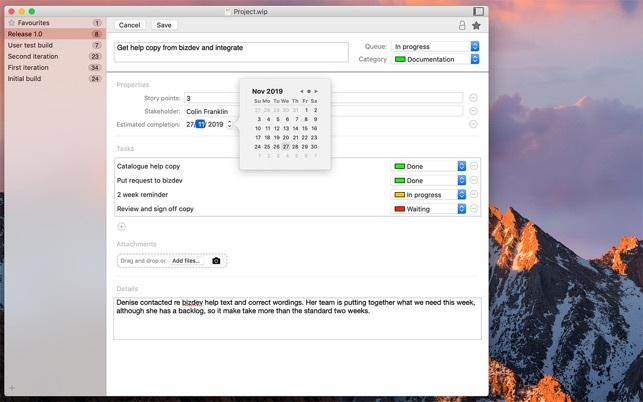 • Customisable queues and folders for organising your work and workflow. • Custom properties mean you can extend cards to include any custom data you need for your projects. • Saves project data locally—no network or third party login required. • Supports all modern macOS interfaces, including document model, versioning, drag/drop, copy/paste, undo/redo, printing, full screen, window tabs, dark mode etc. macOS versioning by default means you’ll never lose your data. 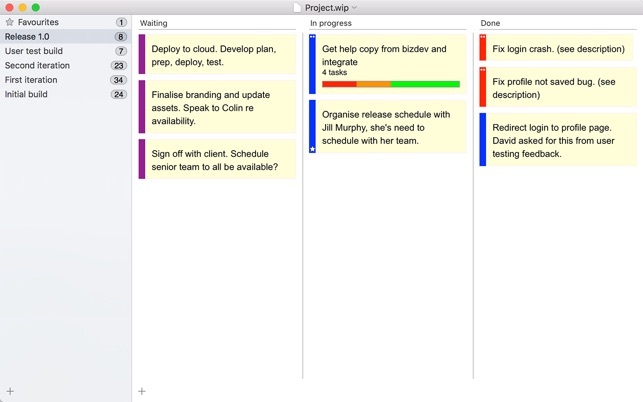 • Great lean replacement for Trello. Now requires macOS 10.13 minimum. Adds support for macOS 10.14 Continuity Camera for adding file attachments. New optional launch window to access previous documents. Consolidation of code and UI in preparation for iOS version, including a name change of “tags” to “categories”. I bought WipQ to help me keep track of clinical reports - which ones are finished, which have deadlines, which are highest priority, etc. The cards on a virtual kanban board metaphor is perfect for this. Some interface elements need refining, from an efficiency viewpoint. For example, double clicking a card doesn’t open the item for editing, but instead opens a window that has an “Open” button that must be clicked ino order to begin editing. 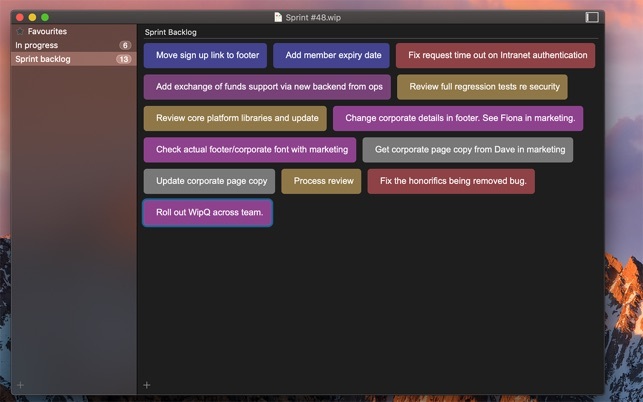 That window has options to change the card’s tag and its location on the board, but those options are available directly from the kanban board itself. I note this not to criticize the app, as I like it very much. It is still relatively new in development and is already very helpful. I hope the developers continue their work on this super helpful visual task/project manager! Thank you so much for your feedback! We've taken all this on board for future development. You can edit a card directly in 1.3, by selecting the card and pressing "e". In the upcoming 1.4 you can also option-double click to edit. You may have missed this because you downloaded 1.2.1 and gave feedback the same day we released 1.3. We are actively developing WipQ based on feedback as well as our own features, so we love feedback! It was not obvious what to do when the app opened. I would give it four stars if the window contents were resizable without resorting to fullscreen. Works great and the minimalist design is not distracting. Much better than a todo list or reminders. Thank you so much for your review and your feedback requests. We do have those features on our wish list, so they are coming at some point as we actively develop WipQ. As far as window resizing goes, absolutely you should be able to resize the window by dragging the sides or bottom right corner, just as you would with any other application window. If this doesn't work, then get in touch via support (on the Help menu) so we can track down the problem and fix it for you. Thanks again! How Can I start to create a project? We're so sorry you feel this way. To start a new project, select "New Project" from the "File" menu, just like all Mac applications. Click on the "New work" folder to the left to show your cards, just like in iTunes or any similar Mac application. 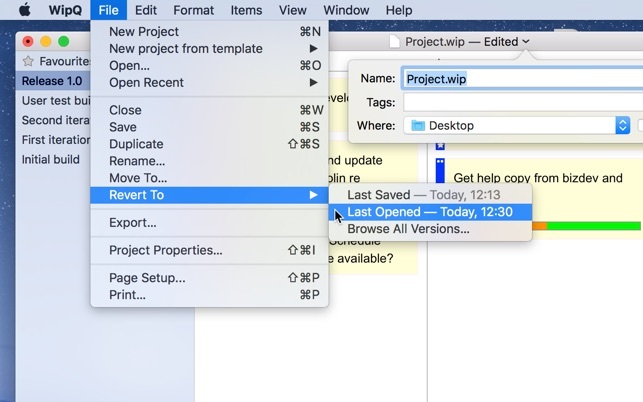 Or select "WipQ help" from the "Help" menu, just like you would it any Mac application. Just checking though, are you sure you put your review against the correct application? We're not sure what you mean by crazy and complicated, as that doesn't sound like WipQ at all. For further help please contact us at support@aggmedia.net and we'll help you get started.